A magician since the age of 13, Ash Arnold has performed all over the country for various clients, such as Jack Charlton OBE, Dave Courtney & many more. He has also performed for various corporate clients such as Evans Halshaw, Arnold Clark, Newcastle United, Prince's Trust, Gateshead Council & Grosvenor Casinos. Apart from being a skilled close up magician, Ash is also a fully trained hypnotist. Not only does he perform hypnosis in an excellent comedy stage act, but also helps people for all kinds of reasons with Hypnotherapy; such as Stop Smoking Therapy, Fears & Phobia's, Stress, Weight Loss & general relaxation hypnosis. 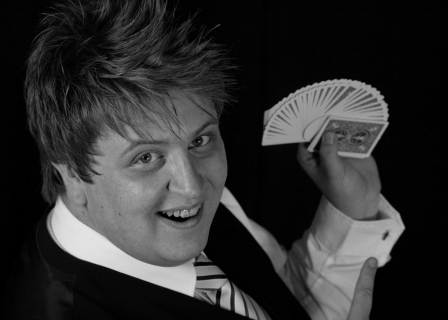 Based in Northumberland, this excellent Close Up Magician has worked around the UK professionally for 10 years. He does Walkabout Magic, Corporate Events, Exhibitions, Weddings, After show Parties, Office Parties, plus much more. Apart from being a magician, Ash is also known as a radio broadcaster on Minster FM in York & Amber Sound FM, where he worked full time on the drive time show. If you're looking for a close up magician, with a great sense of humour & a level of talent that'll keep people talking about your event for years to come; then Ash Arnold is should be your first choice.